On Monday, the Doughboy came to Mickey Mouse’s turf in Orlando at the 45th Pillsbury Bake-Off Contest, the premier American cooking competition. Five men and 95 women, aged 25 to 77, all amateur cooks came from cities like Brookline, MA, Beaver Dam, KY, Koloa, HI, and a few miles away in Windermere, FL to debut their original recipes. 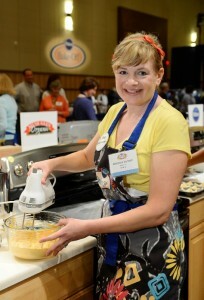 The prize seekers baked, braised and whisked their dreams and talent in 100 mini-kitchens set up in the Peabody Orlando Hotel ballroom. Each vied for the sweetest bragging rights of all, a $1 million grand prize and $10,000 in GE appliances. Contest host Martha Stewart, wearing a crisp, white linen blouse, slim slacks and beige, high-heeled sling backs, walked the Bake-Off culinary battlefield, stopping for laughs, to offer encouragement, or take some snap shots, while her camera crew followed her with video equipment. Meanwhile, many more fans stopped her to take pictures of the cooking, TV and home-style living guru. Pillsbury says it received tens of thousands of recipes that are culled down to the final 100, chosen in four categories: Breakfasts and Brunches, Entertaining Appetizers, Dinner Made Easy, and Sweet Treats. Sweets reigned supreme with many getting sass from salty, savory and spicy ingredients. Sea salted caramel-inspired recipes topped the list of sweet treats, says a Pillsbury spokesman. Holy ravioli — that’s the flavor profile for Christina Verrelli of Devon, PA, who won the top prize with her Pumpkin Ravioli with Salted Caramel Whipped Cream. In true Oscar style, Martha Stewart opened the envelope to announce Christina as the winner in front of 300 guests and her TV audience in the Peabody ballroom, as cameras rolled during the first remote edition of “The Martha Stewart Show” on the Hallmark Channel. A deluge of confetti descended as she gave the sofa-sized check to the tearful, Pennsylvania homemaker, whose husband and two young children soon thereafter joined her on stage. She says times had been tough for them and her husband had been working several jobs. The Pillsbury Bake-Off Contest, first held in 1949 at the Waldorf-Astoria Hotel in New York City, has changed through the years. This year, recipes had to use at least two different “eligible’ products. One ingredient came from a list of Pillsbury products, such as biscuits, pizza crust, cookie dough and others, while a second came from such sponsors as Jif Peanut Butter, Crisco Cooking Oil, Eagle Brand Sweetened Condensed Milk, and others. I was a judge in 2000 when we gave $1 million dollars to Bobbie Sonefeld of Hopkins, S.C., for her Cream Cheese Brownie Pie, a multi-layered dessert that combined Hot Fudge Swirl Deluxe Brownie Mix and refrigerated pie crust. It was a winner whether hot, warm or chilled. Judges must sign a series of confidentiality statements to make sure everything was above board. I remember one form stated that no one had tried to coerce, bribe or influence us. Monday’s Bake-Off started with a spirited parade of the 100 finalists marching into each kitchen. The first 20 minutes are media-free. After that, we can enter the fray and talk to the some nervous, some not-so contestants as they made three versions of their dishes. 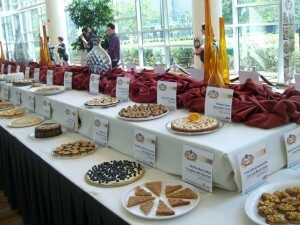 The best is sent to the judges’ room; one is set on a huge table to be photographed and a third is set out for sampling. Luckily, this year’s group of a dozen judges came up with their winner without much fuss. “I don’t remember it ever being so close,” says Jeff Houck, Tampa Tribune food editor, and a judge at the 2010 Bake-Off. “Each recipe had attributes we loved,’’ he adds. The hot, pumpkin ravioli, the first dish sampled, had the extra something that pushed it to the top – even after questioning whether it might be considered too seasonal. While another filling could sub for the pumpkin, it still had the ease of a convenience product, a crescent roll package, paired with a homemade item, salted caramel whipped cream. Christina says she worked with other fillings, such as cream cheese, raspberry, strawberry, and other dips. I tasted 40-50 dishes and was struck by hers and others for their inventiveness and freshness. Once again, moderation wasn’t on the menu. Heat oven to 375°F. Brush 2 large cookie sheets with 2 tablespoons of the butter. In large bowl, beat cream cheese and pumpkin with mixer on medium speed about 1 minute or until smooth. Add egg yolk, vanilla, sugar, 3 tablespoons of the flour and pumpkin pie spice; beat on low speed until blended. Reserve 4 teaspoons of the pecans; set aside. Stir remaining pecans into pumpkin mixture. Lightly sprinkle work surface with 1 tablespoon of the flour. Unroll 1 can of dough on floured surface with 1 short side facing you. Press dough into 14×12-inch rectangle. With paring knife, lightly score the dough in half horizontally. Lightly score bottom half of dough into 12 squares (3×2 1/4-inch each). Spoon heaping tablespoon of the pumpkin filling onto center of each square. Gently lift and position unscored half of dough over filling. Starting at the top folded edge, press handle of wooden spoon firmly between mounds and along edges of pumpkin filling to seal. Using toothpick, poke small hole in top of each ravioli. Using a pizza cutter or sharp knife, cut between each ravioli; place 1 inch apart on cookie sheets. Repeat with remaining 1 tablespoon flour, dough sheet and filling. Brush ravioli with remaining 2 tablespoons melted butter. To serve, place 2 ravioli on each of 12 dessert plates. Drizzle each serving with teaspoon of the caramel syrup; sprinkle with reserved chopped pecans. With spoon, swirl remaining 1 tablespoon caramel syrup into bowl of whipped cream. Serve warm ravioli with whipped cream. Breakfast & Brunches: Sausage-Pomodoro Brunch Bake: Maria Vasseur of Valencia, Cal. Dinner Made Easy: Chicken Empanada Cones: Donna Wolfe of Hamilton, N.J. Entertaining Appetizers: Asparagus, Artichoke and Red Pepper Pizza: Terri Sherman of Palos Heights, Ill.
Log in to www.bakeoff.com to see their recipes.